Over the course of a generation, patriotism in America has been hijacked by the right and abandoned by the left. But the principles and values of true patriotism - country above self, contribution above consumption, stewardship over exploitation, freedom with responsibility, purpose through sacrifice and service, pragmatism, a fair shot for all - are inherently progressive. 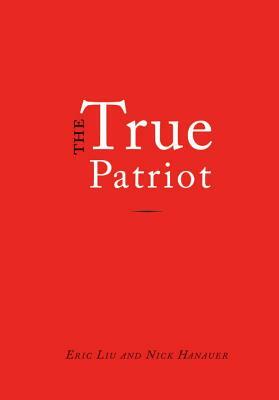 The True Patriot, written in the pamphleteering style of Thomas Paine (Common Sense), challenges progressives to reclaim patriotism - and spells out just how to do it. This powerful and timely "little red book" combines a manifesto, a ten-principle plan, a model speech, and a moral code. Throughout, it weaves between the words of the authors and excerpts from foundational American texts and speeches, as well as a parade of iconic American images. Eric Liu teaches at the University of Washington's Evans School of Public Affairs. Nick Hanauer cofounded the League of Education Voters in Washington State. Both live in Seattle.